If you’ve ever driven along a road in the Southern United States, you’ve seen kudzu vine climbing all over entire forests. This invasive plant was first introduced to the U.S. in an exhibit at the Philadelphia Centennial Exposition in 1876. Gardeners who grew kudzu as ground cover soon discovered to their chagrin that climate conditions in the South are ideal for it to grow completely out of control. The U.S. now loses over half a billion dollars a year in lost crop and control costs, thanks to kudzu! It’s tough to control because pulling down the vines does nothing to kill the plant; you have to locate and sever the “root crown” from the rest of the vine, and this root crown is often hidden. Well, performance-orientation is the kudzu vine of Christianity. It’s a non-native intruder that starts small but soon completely takes over, smothering every part of the Christian life: daily devotions that started as a time of refreshment become dry daily duty; church attendance becomes less about celebrating God’s lavish love than about learning how to be better people; even parenting, which should be inspired by God the Father’s grace toward us, becomes performance-driven and guilt-inducing. It’s the little yeast that works through the whole batch of dough, completely changing it. In each case, they’re “bitter roots.” I get bitter toward myself, or toward others, or toward God. And like kudzu, performance-orientation is tough to kill. You have to aim for the “root crown”: the idea that I can, in any way, earn part of my salvation or earn more of God’s love. Once I allow this as a possibility, the climate is right for performance-orientation to take over everything. I protect against that idea by refreshing myself repeatedly with the truth of grace: There is nothing I can do to make God love me more, and there is nothing I can do to make God love me less. He promises that He loves me and saves me with His infinite, unconditional, all-sufficient grace! How many times have you heard heavy, condemning sermons that tell you, “You ought to be praying more! You ought to be giving more! You ought to be witnessing more, or serving God on some committee more!” How often do you go to church looking for encouragement only to hear about your failure and how disappointed God must be in you? The last thing I need is for someone to lay a heavy burden on me about my failures. I know I ought to be doing more. No one needs to tell me I don’t read my Bible enough or pray enough. All I get from such messages is a huge guilt complex. My frustration increases because I really want to love God more, to pray more, to have a deeper fellowship with Him. When we place our emphasis on areas of failure, we end up creating defeated, discouraged Christians who give up and drop out of the race. Look at the New Testament letters and you will see a totally different emphasis. Again and again, they lay a foundation not of what we ought to be doing for God, but what God has already done for us! 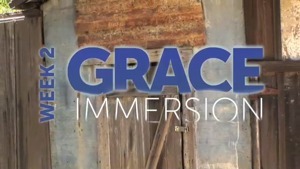 But you may be wondering, “If it’s not about my performance, then how does grace-oriented Christianity change my life? If I am saved by grace, why does being a Christian make me so tired? What am I doing wrong? Turn the page. Which of the three results of missing grace have you struggled with most? How does missing the grace of God lead to “bitter” roots? Ask God to help you see if you are missing the grace of God in some area of your life now, using the three results of missing grace as a template: Are you a perfectionist, judgmental, or legalistic? Ask God to show you if you have a “bitter root.” Ask Him to help you root it out.